Bathroom is a place where you want to wake up, energized and refreshed with everything. In recent years, bathroom has expanded significantly in size – old homes have much small bathrooms, but in new construction you can design your small bathroom in a big with decorating tricks that create the illusion of more spaces. Lighting is the most important fixture of a bathroom; lighting paired with the right colour can affect your mood. It makes bathroom look fresher and larger. There are various bathroom decoration items available in the market, from which you can utilize your space with beautiful decor accessories like, wall shelves, wall mounted baskets and small style cabinet furniture. 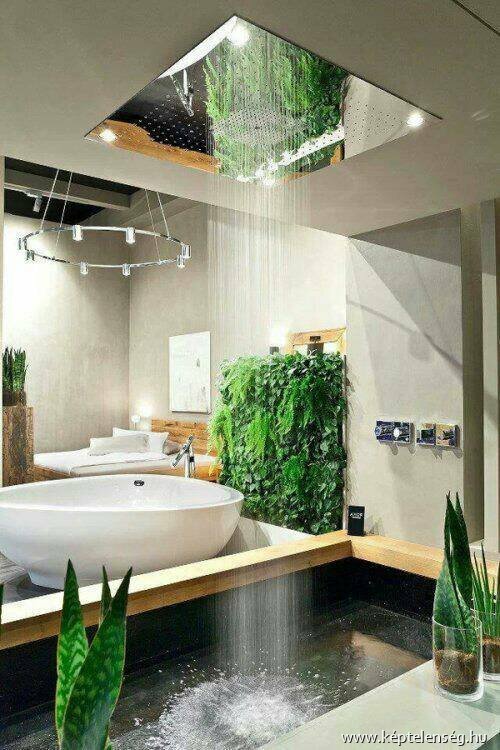 Let’s have a look for bathroom decor ideas. This style is the combination of shabby chic and traditional style, so the accessories choose according to the mix. This bathroom decor needs to focus on using some natural stones and wooden beams and furniture and some industrial elements like we can see in this picture. 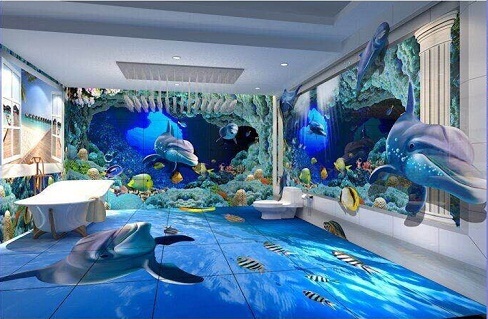 Designing a kid’s bathroom can be both fun and challenging. 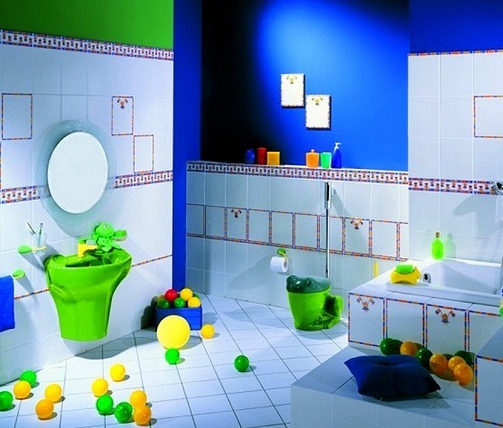 You can experiment with various colours and patterns or you can explore various themes to be implemented in the kid’s bathroom. So the kids can play and enjoy their bath time. If you want to make your bathroom more eye-catching, you need to choose the right accent wall for bathroom wall decor. Choose one wall to be the focal point, the back wall looks to be the best. Add a coloured mosaic or wooden pallets add a mysterious atmosphere in it. This white colour paint is a perfect selection for classy lover. Not just paint the wall; you can also paint your cabinets with this colour. 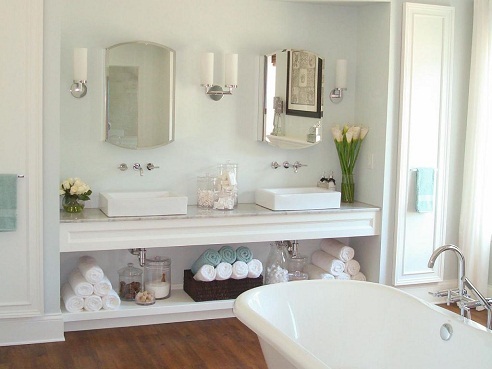 White and bright matching looks amazing with white tub. Glass shelves give it an extra beauty. Colour blocking is the latest trend of this season by combining strong bright colours in the same design. Bright coloured towels, lime bin, hot pink tower and colourful cabinets and the coloured line rug look refreshing and energetic. This is the perfect choice for small bathroom decorating ideas. 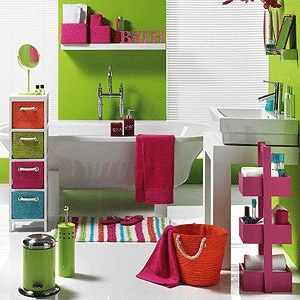 Bathroom accessories can be used to improve the decor and to make more comfortable and inviting. Bathroom set includes soap dispenser, storage trays, brush holder, napkin holder and makeup holder, etc. 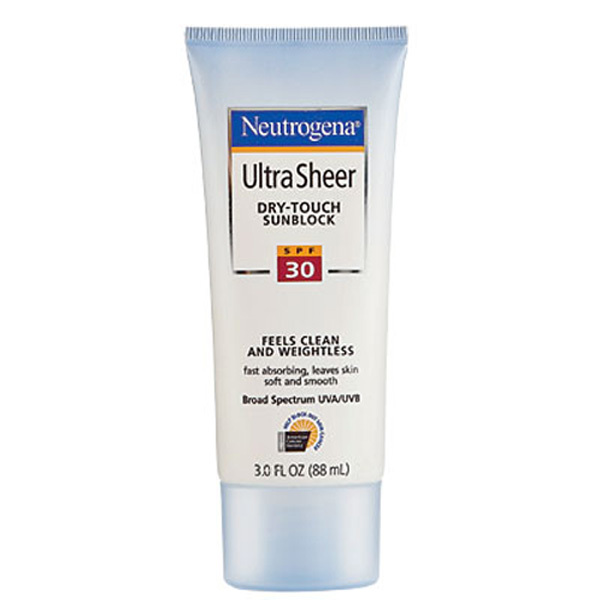 and other useful items to store. This brown wooden and sequence border design looks elegant. This is the latest decorating ideas for bathrooms. This design generally used in hotels and shopping centres, but now it comes to home. This sounds like a dream that when you walk into your bathroom and feel like that you just stepped into underwater, a dolphin right looking at you as you shower. It feels like close to nature. 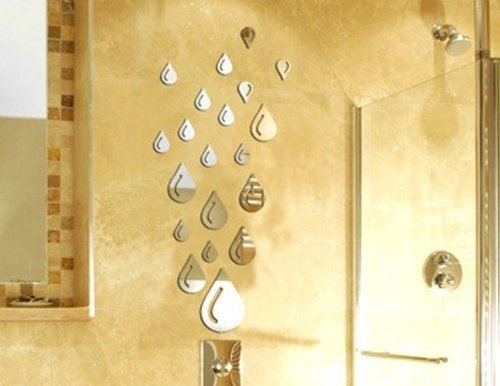 Open shower is an incredible idea for bathroom decorations. The person wants to go in and never get out. 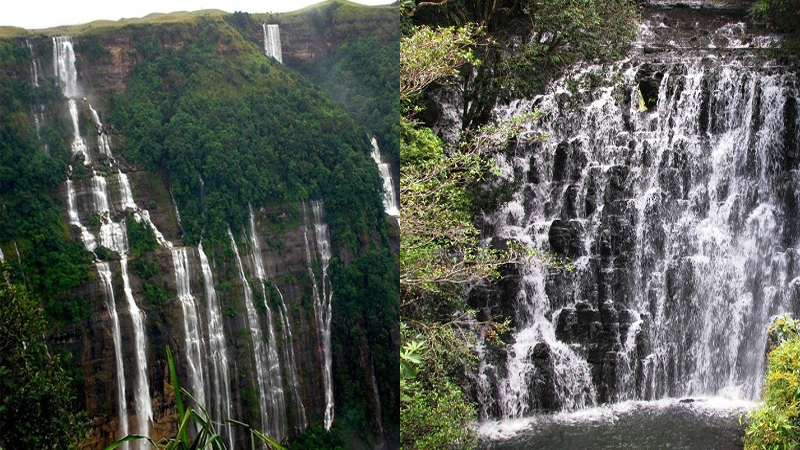 With all this beautiful nature view like rainfall, make feel relaxed to the person. This is not space consuming, but it makes your bathroom bigger and wider. 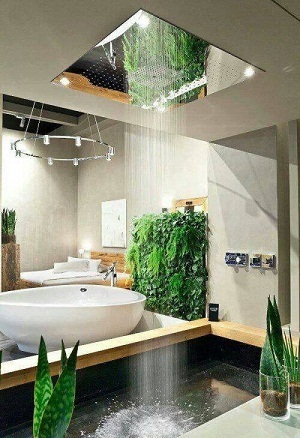 Small plants make this bathroom so beautiful. When thinking of bathroom wall decor ideas for art, think beyond a canvas print. A wall gallery of favourite objects like mirror, and other metal pieces is another way to decorate your wall. 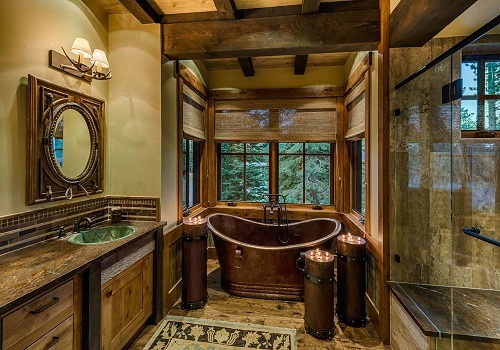 For many peoples, bathroom can be the most relaxing room in the house. These bathroom decorating ideas will help you to design a peaceful, beautiful look for your bathroom that will melt your stress away. 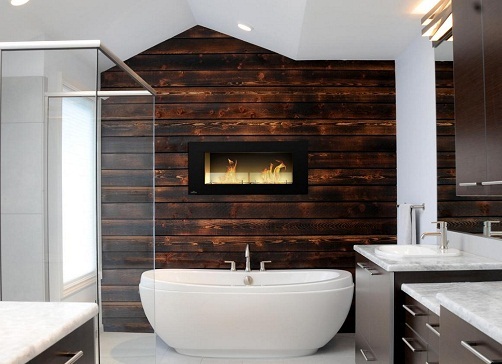 When designing the bathroom, space is the key to look beyond. You can decorate your bathroom with curtain, mirror and paintings also. If you have a space problems, then use pull out drawers for cabinet. For small bathroom decor, any style can work traditional, rustic and country styles which are generally more sleek and narrow.